This month a squadron exchange took place between the Royal Air Force 17 Squadron, flying the Jaguar GR.1, based at Bruggen and the Italian Air Force 132 Gruppo, based at Villafranca AB, flying the F-104G. It was a 2 way exchange. Seen at Bruggen were MM6599/3-01, MM6533/3-03, MM6598/3-07, MM6588/3-10 (with 18 Gruppo markings). The four Starfighters arrived at Bruggen on April 12th after diverting to Nörvenich due to bad weather at Bruggen(Snow and Fog) on the initial planned arrival day April 11th. The pre-exchange visit toke place on March 8th by aircraft MM6599/3-01, MM6544/3-20 and TF-104G MM54253/20-18 (on loan from Grosseto). They left again the next day. Italian Air Force transport was performed by DC-9 MM62012/31-12 to Wildenrath (not Bruggen) on April 15th whil on April 2oth and again on April 22nd the DC-9 MM62013/31-13 was seen at Bruggen. Aside the DC-9 aircraft also a C-130 Hercules (MM61990/46-04) performed transport on April 20th and 21st. 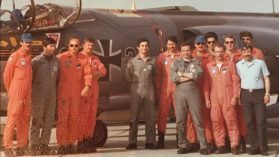 This month a squadron exchange took place between the German Air Force JBG31 (1st Staffel), based at Norvenich and the 493 TFS/48 TFW, based at Lakenheath AFB flying the F-111F aircraft. It was a 1-way exchange, only the Germans flew to the UK. 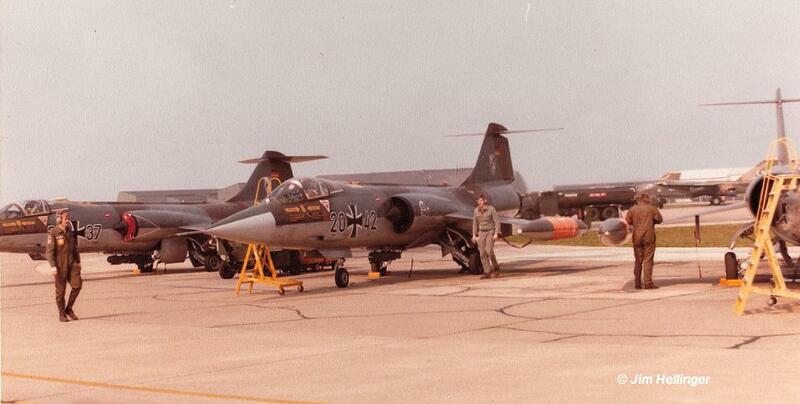 On the 17th four Starfighters landed being F-104G 20+42, 22+59, 25+37 and TF-104G 27+84. During the exchange also TF-104G 27+35 was seen at Lakenheath. 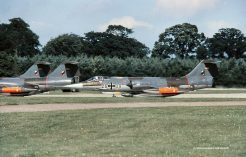 Beneath a number of photos taken by Jim Hellinger showing the German Starfighters at Lakenheath. 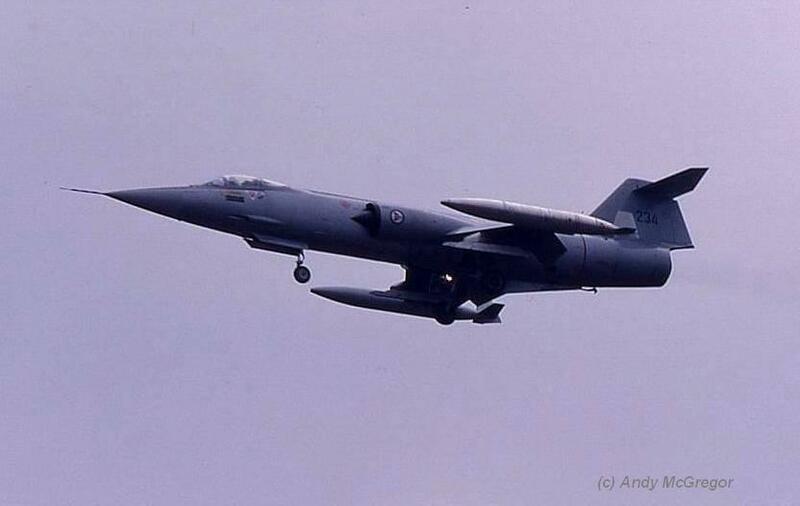 This month a squadron exchange took place between the Norwegian Air Force 331 and 334 Skv, based at Bodo AB and a Royal Air Force 208 Squadron, flying the Buccaneer based at Honington. It is unknown if it was a 1 or 2 way exchange but at least the Norwegians flew to the UK. On 2 May aircraft 234, 833 and 860 landed at Honington a few days followed by 240. Other aircraft were never identified but very likely these included CF-104D 637 and CF-104 836 and 800 since all got a 208sq zap applied on the aft-section around that time. 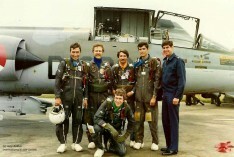 It was a trio-exchange since both Bodo based squadrons participated. 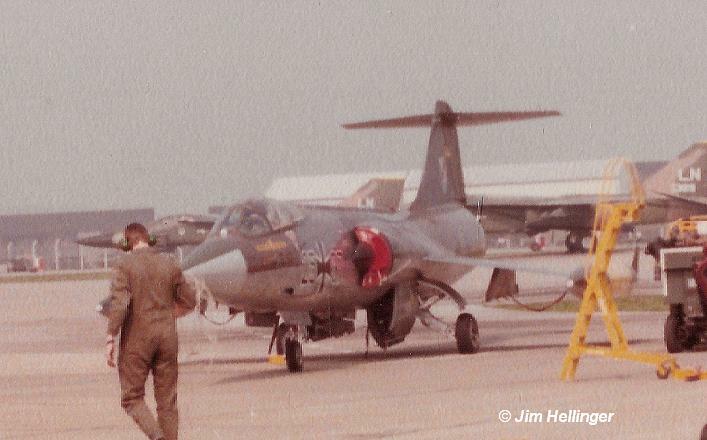 Pre-exchange took place on 29 March 1978 when TF-104G 38469 visited Honington together with one seater 890. Some believe the aircraft 233 landed at Honington on May 2nd as well. 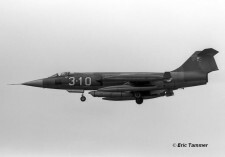 In April 2008 Tom Svendsen took a photo of a 208 Squadron zap still found on the aft fuselage of CF-104D 637 at Bodo AB (see photo beneath). Also photos from aircraft 234 and 833 can be found while landing at Honington on May 2nd. Further beneath aircraft 860 taxying at Honington and finally a photo showing the 890 during its pre-exchange on March 29th. 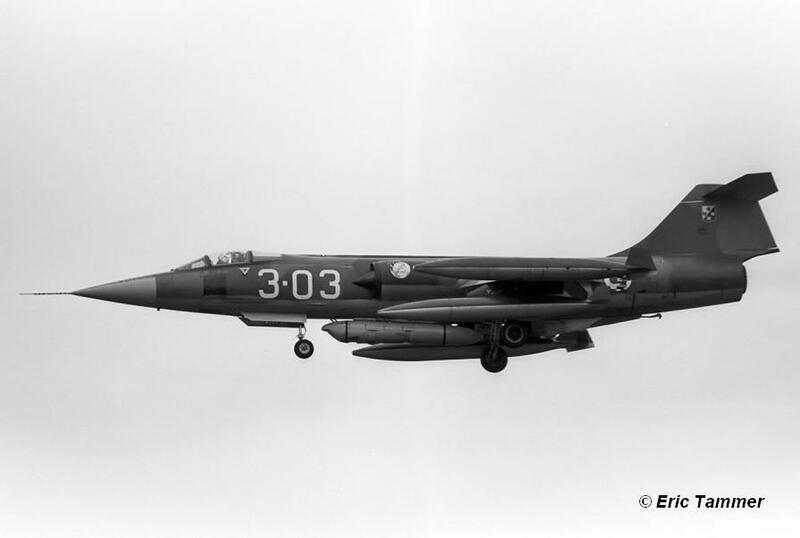 This month a squadron exchange took place between the German Air Force JBG34 (2nd Staffel), based at Memmingen AB and the Italian Air Force 156 Gruppo, based at Gioia del Colle flying the F-104S. It was a 2 way exchange. Seen at Memmingen were aircraft MM6908/36-36, MM6911/36-39, MM6785/36-44 and MM6923/36-47. The MM6911 encountered an accident during this exchange while landing at Ramstein Air Base and run of the runway with its nose wheel. 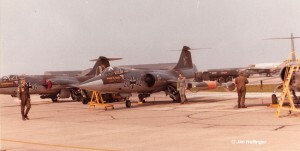 Beneath a photo of F-104S MM6911 sustaining minor damage when it run of the runway at Ramstein Air Base. (Thanks to Peter Doll). 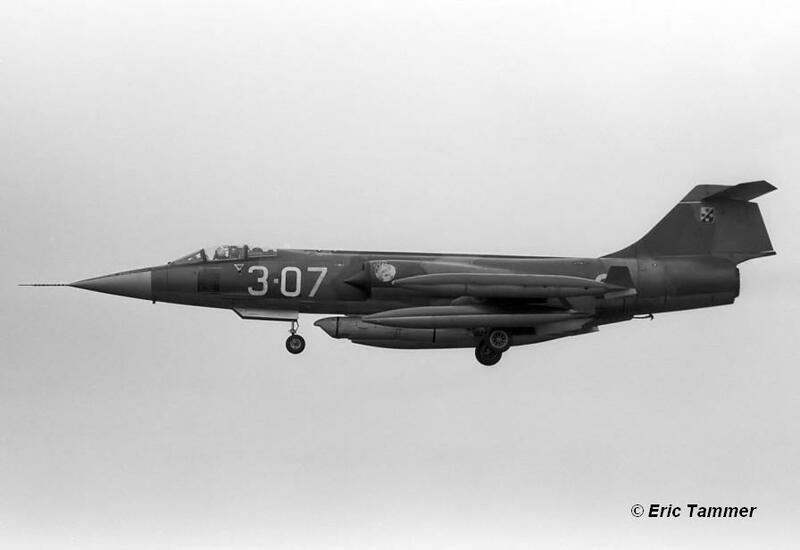 This month a squadron exchange took place between the Dutch Air Force 311 Squadron based at Volkel AB flying the F-104G and the French Air Force EC 2/12 ”Cornouaille” based at Cambrai flying the Mirage F-1. It was a 2-way exchange where four Mirages flew to Holland. 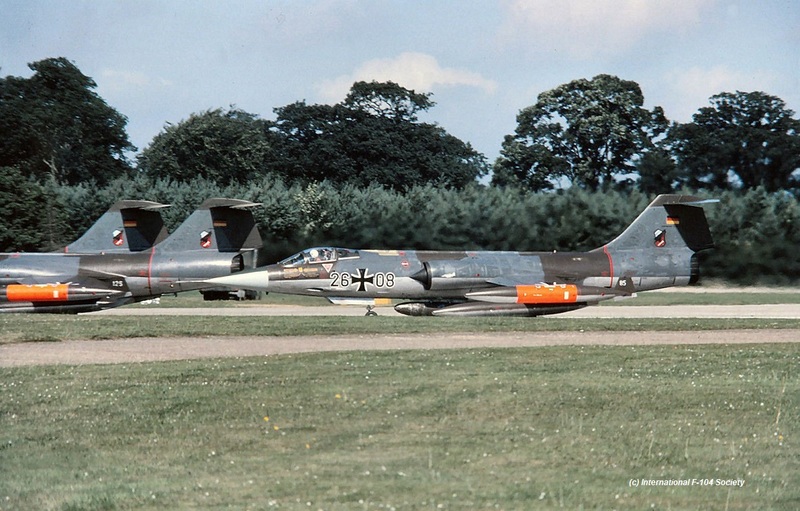 Also four Starfighters flew to France being F-104G D-6680, D-8114, D-8280 and D-8300. This month a squadron exchange took place between the USAFE 480 TFS/52 TFW, based at Spangdahlem AFB, flying the F-4D Phantom and the Italian Air Force 155 Gruppo, based at Istrana flying the F-104S. It is was a 2 way exchange. 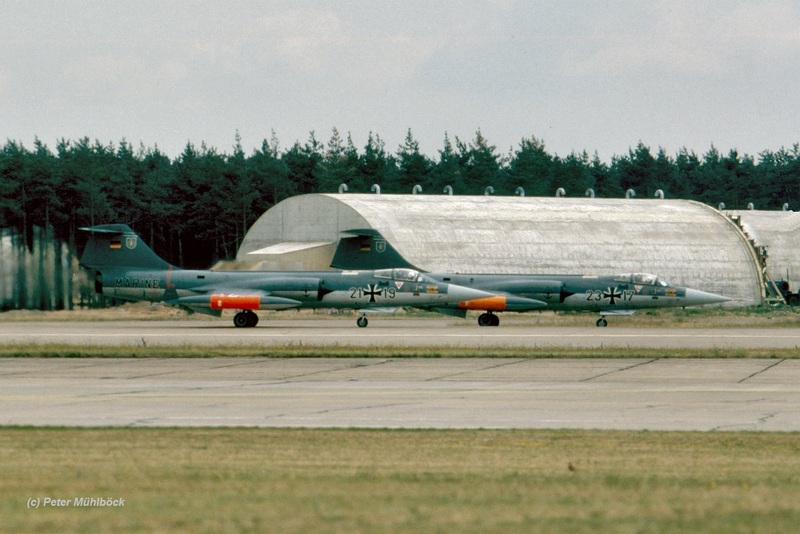 Four SP coded Phantoms flew to Istrana and four Starfighters to Germany. These were MM6744/51-35, MM6797/51-45, MM6910/51-46 and MM6914/51-47. There was an open house at Spangdahlem AB on the 18th of June. Beneath the Italian MM6914 code 51-47 is seen at Spangdahlem during the exchange. In June and October 1978 a "shifted" squadron exchange took place between one of the staffels from the German Navy MFG2, based at Eggebek, flying the (R)F-104G and the French Navy squadron 11F, based at Landivisiau flying the Etendard. 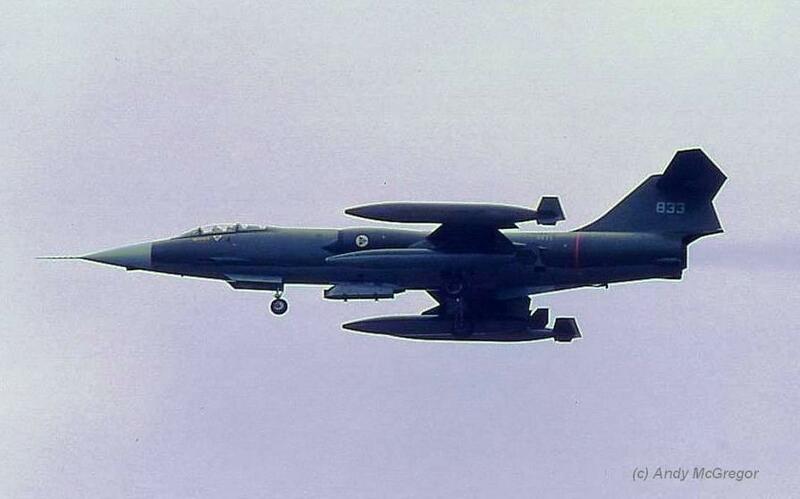 The French Etendard IVM aircraft flew to Germany in June and lateron the Starfighters from Eggebek flew to France in October when the French 11F just had converted to the Super Etendard aircraft. 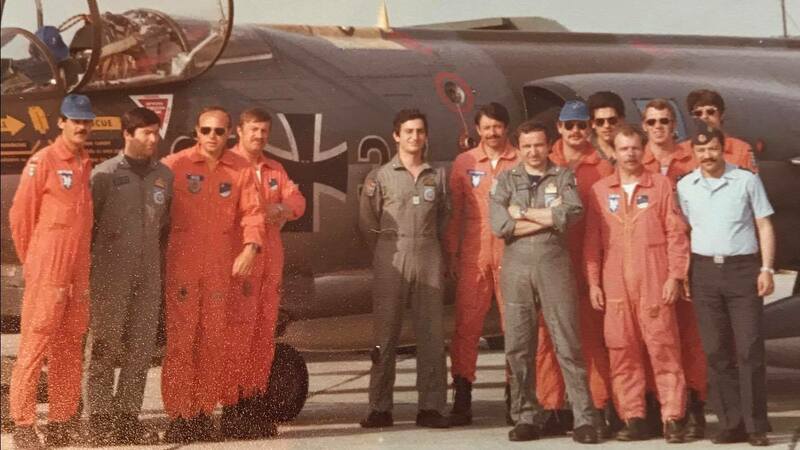 This month another squadron exchange took place between the other staffel from the German Navy MFG2, based at Eggebek, flying the F-104G and the Royal Air Force 43 Squadron, based at Leuchars flying the F-4 Phantom. It was a two-way exchange. 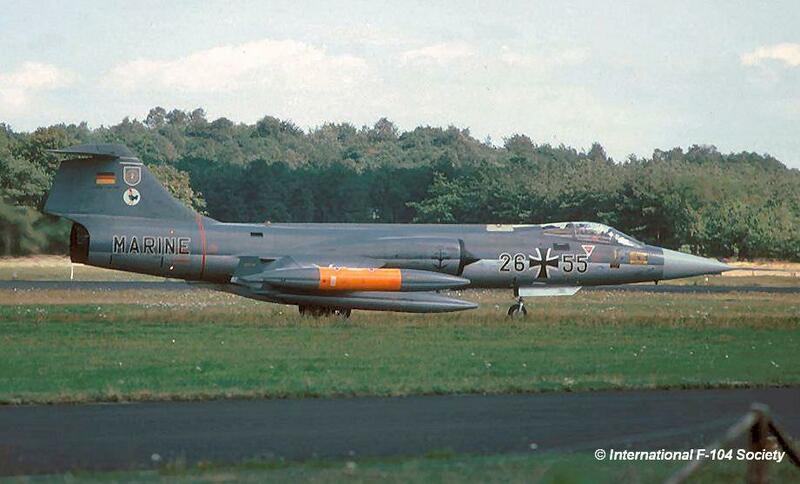 Six Phantoms flew to Germany and also six F-104G Starfighters flew to the UK. Aircraft seen in the UK and receiving 43 squadron badges on their tails included 21+29, 23+12, 23+17, 26+55 and 26+82. 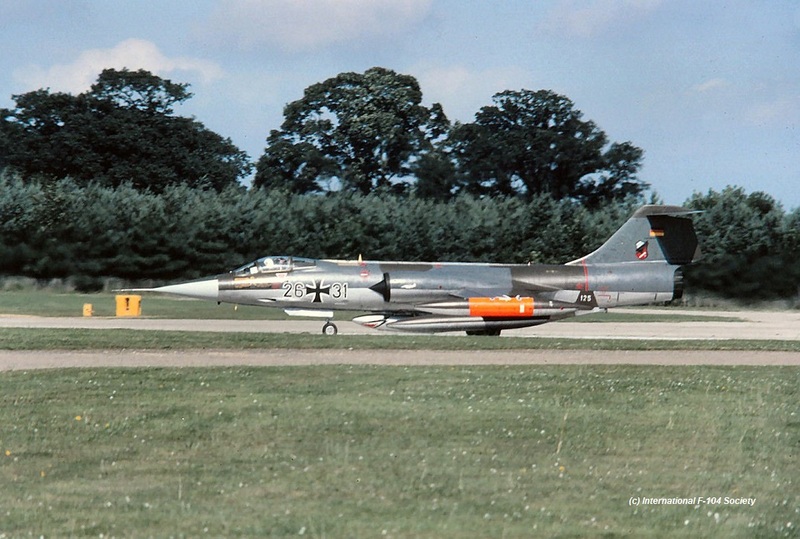 Photo beneath shows F-104G 26+55 which got zapped by a 43 squadron badge on its tail which stayed there for a long time (seen during a visit at Soesterberg AB later), and a photo taken at Leuchars by Peter Mühlböck showing 21+19 and 23+17. This month a squadron exchange took place between the German Air Force AG51, based at Bremgarten, flying the RF-4E Phantom and the Italian Air Force 12 Gruppo, based at Gioia del Colle, flying the F-104S. It is unknown if it was a 1 or 2 way exchange but at least the Italians flew to Germany with aircraft MM6815/36-13 and 3 others. There has been a one-way squadron exchange between the Belgium Air Force 10 Wing 23 Smaldeel, based at Kleine Brogel, flying the F-104G and Hellenic Air Force 336 Mira based at Araxos flying the F-104G as well. Sadly no more details are known. Only Belgium Starfighters visited Greece. 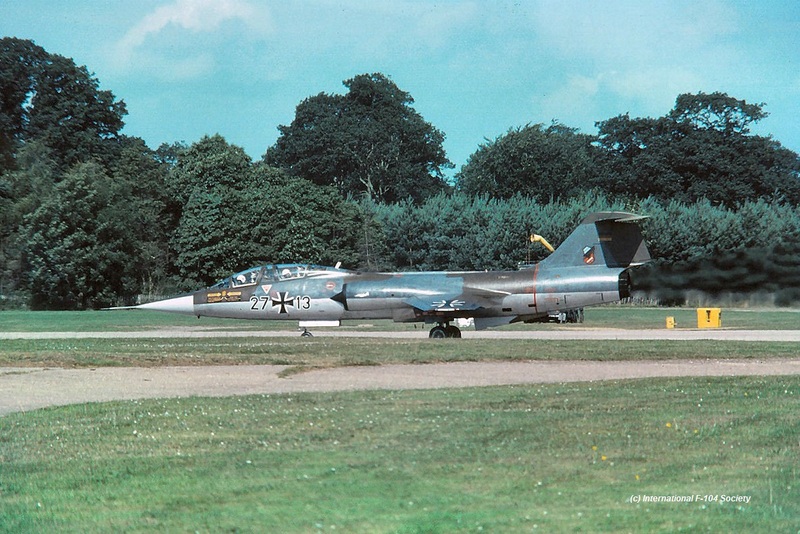 This month a squadron exchange took place between the German Air Force JBG32, based at Lechfeld AB, flying the F-104G and RAF 41 Squadron equipped with the Sepecat Jaguar GR.1, based at Coltishall. It was a 2 way exchange. The Germans flew to the UK with aircraft 25+59, 26+08, 26+31, 26+49 and 27+13 all arriving July, 18th. On July 24th two additional Starfighters arrived being 21+45 and two-seater 27+83. On the 27th all aircraft departed again except for 26+31 which departed already July 25th. The air-air photo beneath shows a Jaguar flying formation with 24+97 and 21+86. 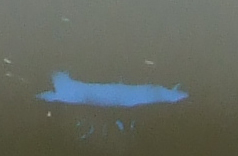 It was taken North or Kempten/Allgäu, around 60km SW of Lechfeld. Other photos show 26+08, 26+31 and 27+13 ready for leaving Coltishall again for home, July 27th. 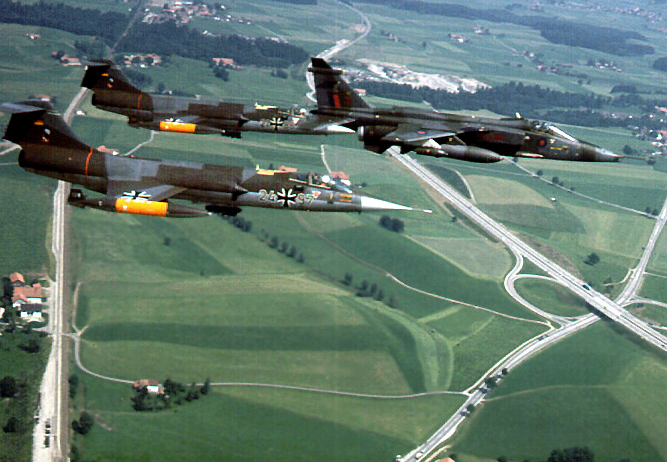 This month a squadron exchange took place between the USAFE 36 TFW (22, 53 or 525 TFS), based at Bitburg AFB, Germany, flying the F-15 Eagle and Italian Air Force 9 Gruppo based at Grosseto flying the F-104S. 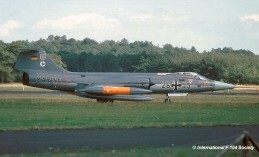 It is unknown if it was a one or two way exchange but at least four Starfighters flew to Germany. It looks like that in July (or late June) 1978 a squadron exchange took place between the German Navy MFG1 based at Schleswig Jagel flying the F-104G and an unknown Royal Air Force squadron based at Lossiemouth. In this period four Starfighters were seen at Lossiemouth being 22+88, 22+95, 26+60 and 26+80. We still need confirmation. 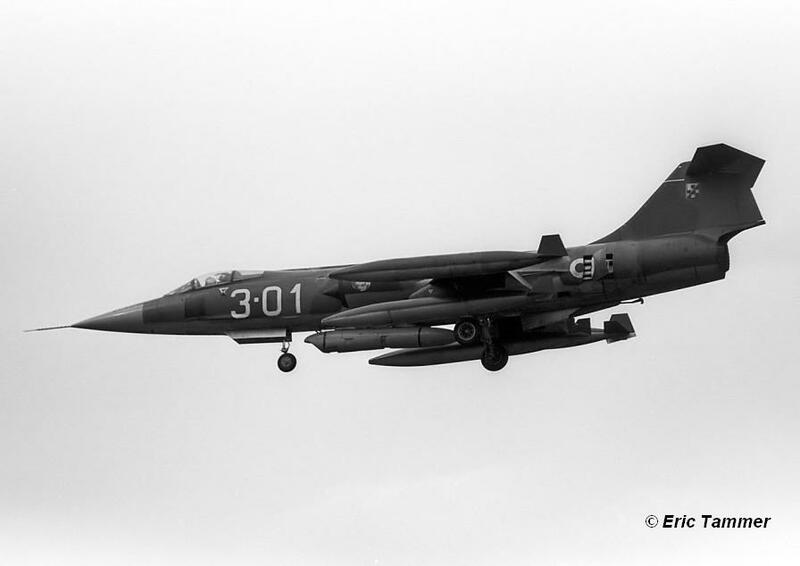 This month a squadron exchange took place between the Dutch Air Force 312 Squadron, based at Volkel AB flying the F-104G and USAFE 494 TFS/48 TFW based at Lakenheath (some mentioned 495 TFS), flying the F-111F fighter bomber aircraft. 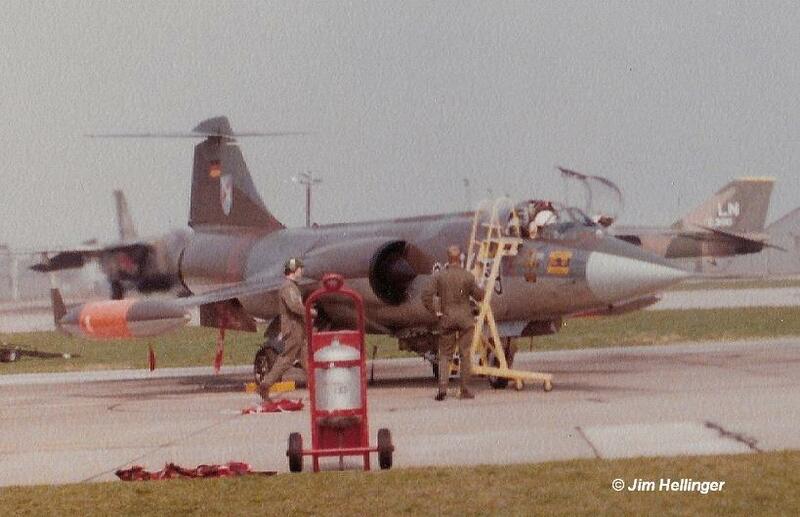 It was a 1-way exchange where the following Dutch Starfighters flew to the UK : D-6700, D-8245, D-8318, D-8337. Also three other 104s have been flying over to the UK but were not identified. Transport was flown by Dutch Air For ce F-27M Troopships from 334 squadron. On August 15th, these were C-7 and C-9 flying to the UK. Beneath a nice photo taken at Lakenheath, thanks to Joop Bakker. 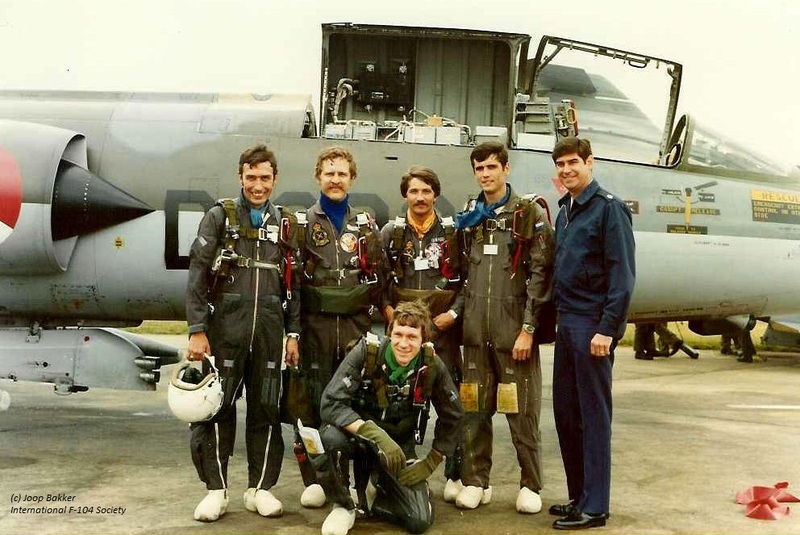 Sitting Jan Brekelmans, standing from left to right (late) Ton Kooymans, Tom Bakker, (late) Peer van Moorsel, Joop Bakker and finally the squadron commander of 494 TFS. 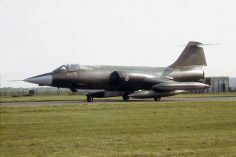 This period a squadron exchange took place between the Dutch Air Force 323 Squadron, based at Leeuwarden AB, flying the F-104G and Belgium Air Force 2 Smaldeel based at Florennes flying the Mirage 5. It was a 2-way exchange. 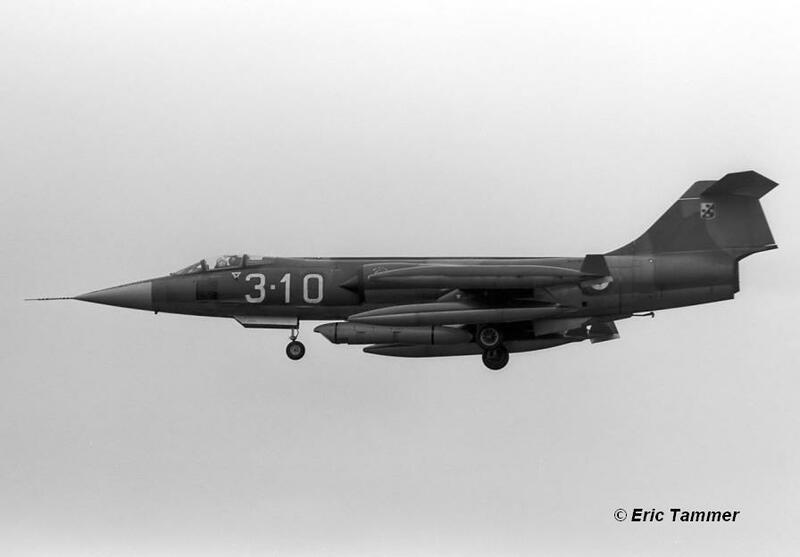 The Dutch also flew two TF aircraft to Belgium being F-104G D-8058, D-8083, D-8090, D-8331 and TF-104G D-5813. Aircraft D-8083 was exchanged with D-8286 on August 30th and D-5813 was exchanged with D-5702 also August 30th. Beneath two photos thanks to pilot Guy Putker showing a formation over the Belgium Ardennes (Guy Putker, Leo van den Born and Peter Berlijn) during a trip via Mont St. Michel in Normandië. 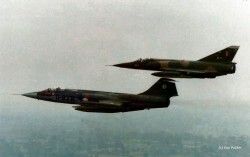 And a formation flight of D-8331 with a Belgium Mirage over Belgium.. This month a squadron exchange took place between the German Air Force JBG33, based at Buchel AB, Germany, flying the F-104G and Italian Air Force 154 Gruppo based at Ghedi also flying the F-104G. It is unknown if it was a one or two way exchange but at least four Italian Starfighters flew to Germany. 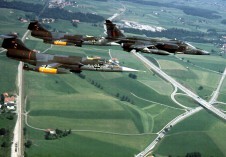 This year a squadron exchange took place between the Canadian 421 Squadron, flying the CF-104 Starfighter at Baden-Sollingen and RAF 23 Squadron, based at Wattisham, flying the Phantom FGR2. 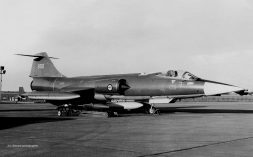 It was a shifted exchange where a number of Canadian Starfighters flew from Wattisham in October and the Phantoms flew from Baden already in July. 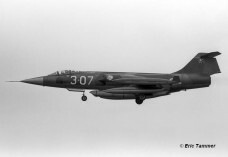 In June and October 1978 a "shifted" squadron exchange took place between one of the staffels from the German Navy MFG2, based at Eggebek, flying the (R)F-104G and the French Navy squadron 11F, based at Landivisiau flying the Etendard. 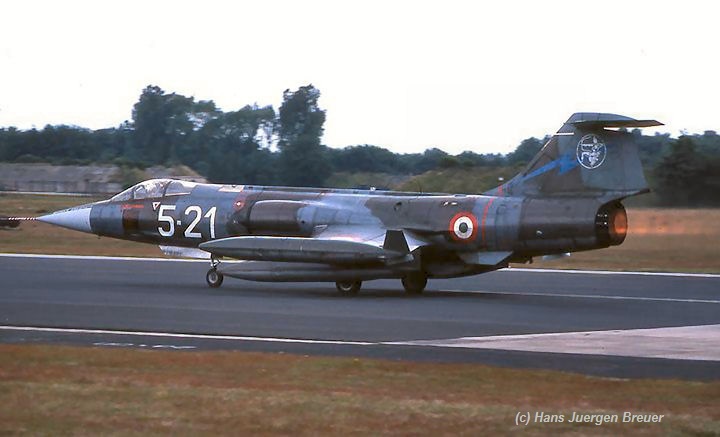 The French Etendard IV aircraft flew to Germany in June and lateron the Starfighters from Eggebek flew to France in October when the French 11F just had converted to the Super Etendard aircraft. 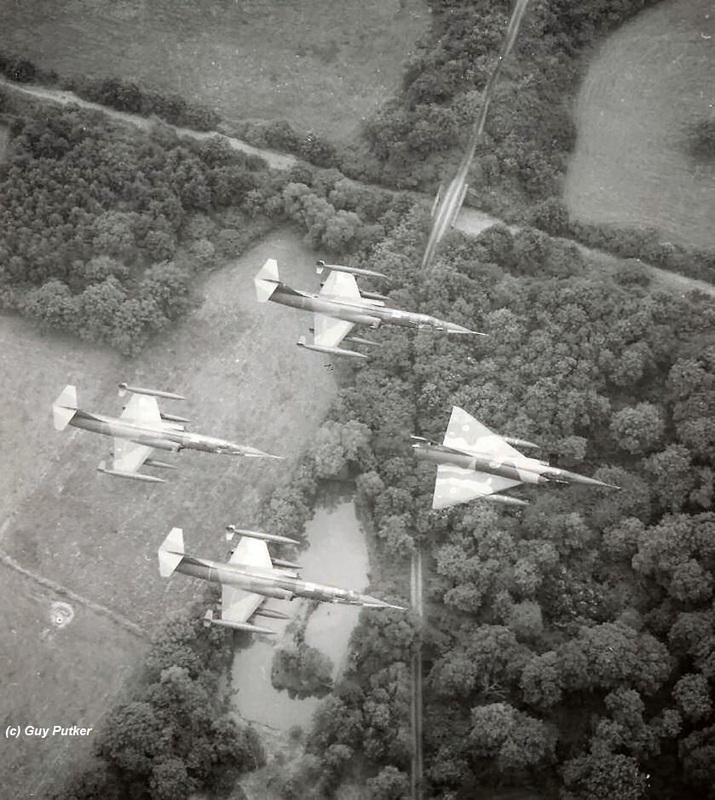 This period a squadron exchange took place between the Dutch Air Force 315 Squadron, based at Twenthe AB, flying the NF-5 and Italian Air Force 22 Gruppo based at Istrana flying the F-104S. It was a two way exchange. Four NF-5A and two NF-5B aircraft flew to Italy while four Starfighters flew to Holland being : MM6714/51-11, MM6932/51-15, MM6718/51-16 (just repaired after an accident at Sigonella) and MM6937/51-20. Aircraft MM6778/51-04 and MM6730/51-21 together with TF-104G MM54232/20-6 arrived on the 10th of October 1978 for a pre-visit. Beneath a photo thanks to Gerrit Hiemstra of MM6932 code 51-15 at Twenthe Air Base. This month a squadron exchange took place between the Dutch Air Force 322 Squadron, based at Leeuwarden AB, flying the F-104G and Royal Air Force 19 Squadron based at Wildenrath, Germany, arriving at Leeuwarden with four Phantom FGR.2 aircraft. It was a 2-way exchange. 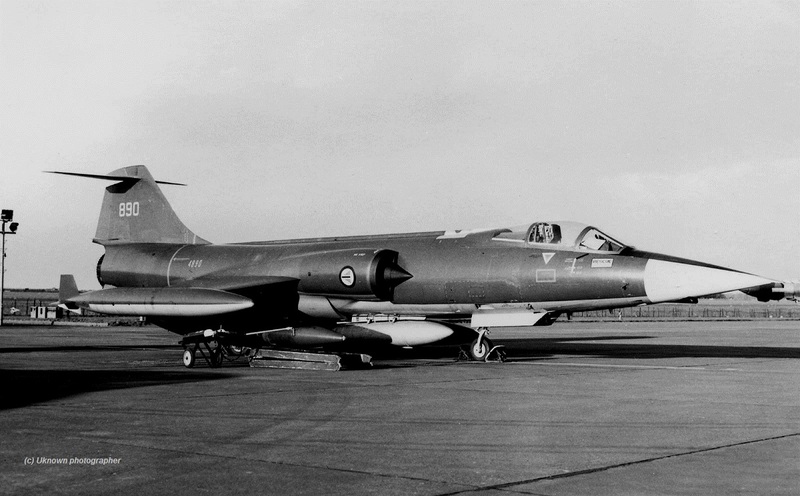 It was a very tragic squadron exchange where three Starfighters were involved in accidents. First on November 21st when during the landing at Wildenrath AB, Germany, D-8341 collided with D-8098 also landing and flown by Elt J.C. de Waard. The D-8341 collided with his forward cockpit section into the aftsection of the D-8098. 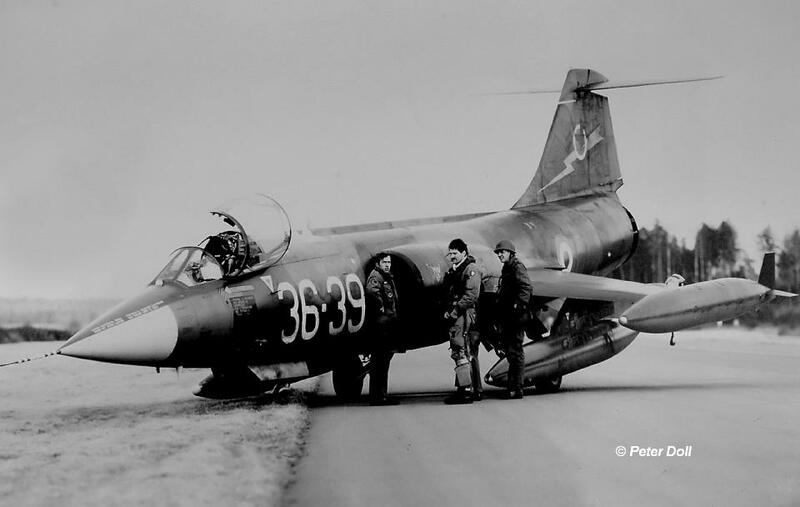 The pilot, of the D-8341, Lt Hennie Elbersen was sadly killed instantly by this collision while the other pilot was safe but shocked about what happened. Two days later, November 23rd, aircraft D-8338, was damaged when during takeoff at Wildenrath it encountered a nose-wheel collapse. It went back to homebase Leeuwarden by road for repair on November 30th. Soon after repair D-8338 was transferred to Volkel AB (312 squadron).The D-8341 was declared written off and the cockpit section was closed by welding. It became a tow-instruction aircraft at Volkel AB. The D-8098 was also declared written off due to the damage and the operational future (planned replacement by F-16 aircraft). It stayed at Leeuwarden as towing instructional aircraft. 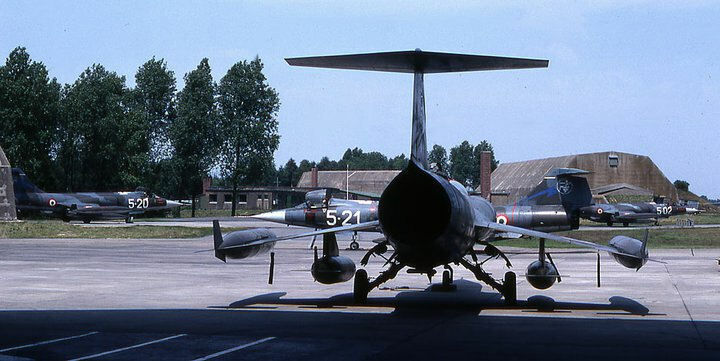 The Belgium Air Force 1 Wing - 349 Squadron operating the F-104G at Beauvechain, exchanged this month with Royal Danish Air Force 723 Eskadrille, operating the F-104G Starfighter from Aalborg. It is unknown if this was a one or two-way exchange. This year a squadron exchange took place between the USAFE 26 TRW, based at Zweibrucken AFB, flying the RF-4C and the Italian Air Force 28 Gruppo based at Villafranca, flying the RF-104G. 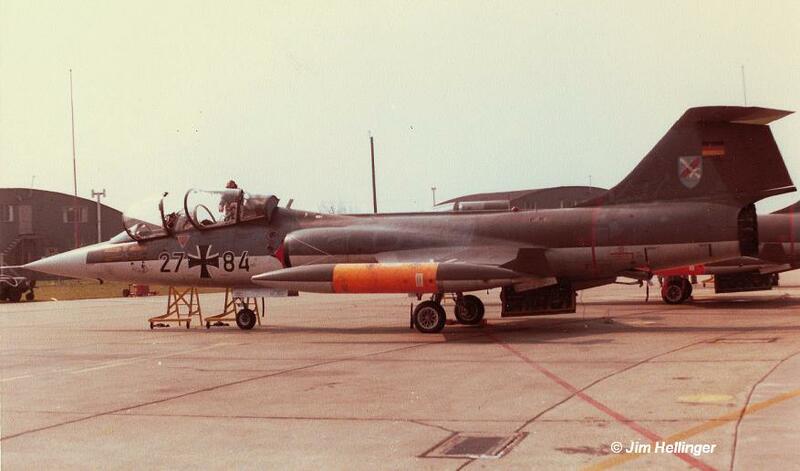 It is unknown if it was a one or two way exchange but at least the Italian Starfighters were seen at Zweibrucken. This year a squadron exchange took place between the Dutch Air Force 306 Squadron, based at Volkel AB flying the RF-104G and Portugese Air Force (Força Aérea Portuguesa) ESQ.51/ESQ.201 based at Monte Real AB. 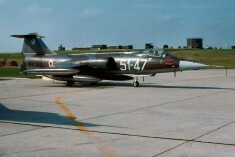 It was a 1-way exchange, the Dutch Starfighters flew only to Portugal. Sadly the aircraft were not identified yet. 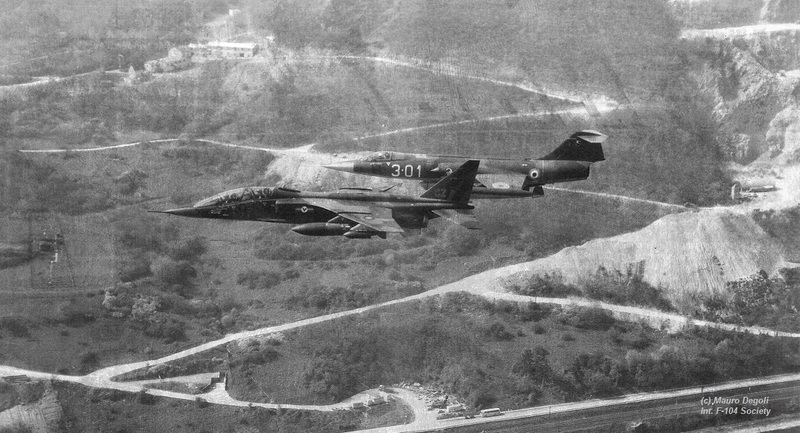 This year a squadron exchange took place between the French Air Force Escadre de Chasse 2/11, based at Toul-Rousieres, flying the Jaguar A and Italian Air Force 10 Gruppo based at Grazzanise flying the F-104S. It is unknown if it was a one or two way exchange. 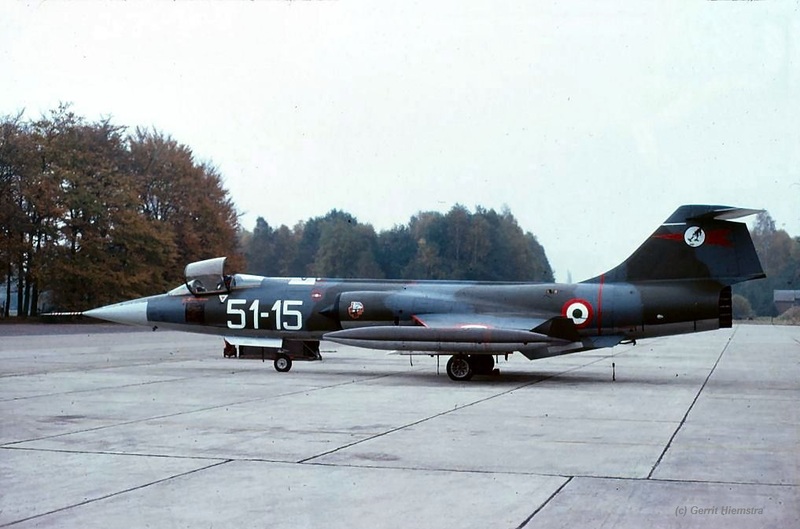 There are reports that this year also a squadron exchange took place between the Belgium Air Force 10 Wing 31 Smaldeel, based at Kleine Brogel, flying the F-104G and Italian Air Force 23 Gruppo based at Rimini flying the F-104S. Sadly no more details are known. 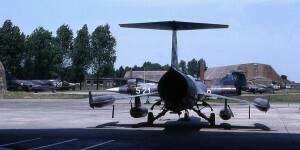 The Belgium Air Force 1 Wing - 349 Squadron operating the F-104G at Beauvechain, exchanged this period with RAF 111 Squadron, operating the Phantom FGR.2 at Leuchars. It was a 1 way exchange, only the Phantoms flew to Beauvechain, Belgium.